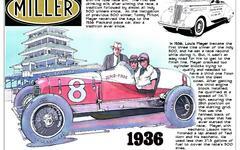 This article was published in the May 31, 1911 Indianapolis Star, the day after the first Indianapolis 500. I find articles like this very special as typical history books and typical newspaper or magazine accounts rarely provide this kind of insight. For example, what is chronicled here are parties and dinners race day night as drivers, owners, teams and manufacturers celebrated events of the first Indianapolis 500. Charming accounts of how winner Ray Harroun and second-place Ralph Mulford were cheered as they walked through the lobby of the Claypool Hotel. B.J. Mutachier, maitre d'hotel of the Claypool said, "Of all the places I have ever been - the cafes of Chicago, New York and other large city hotels - I have never seen such a sight as this." George W. Wishart, the millionaire Wall Street investor, hosted fourteen guests at the Denison Cafe in honor of his son, Spencer Wishart, who drove their private Mercedes to fourth place. William Holt, manager of the Denison Hotel, said, "No city in this country has ever seen such a day as Indianapolis has seen today." At the Claypool, Harroun and Bob Burman attended a large dinner as guests of the Dorian Rim Company. W.L. Burgess, president of Dorian, attended with his wife, as did Buick's team manager Dr. Wadsworth Warren and his wife; A.R. Heiskell of Nordyke & Marmon, and H.B. Hewitt of the Premier Motor Manufacturing Company. This group composed lyrics about the Marmon Wasp set to the tune of "In the Good Old Summertime."